27 February. Armed men in unmarked military uniforms seize the airport in Simferopol, Crimea, and occupy the Crimean Parliament and government buildings. 3 March. Reshat Ametov becomes the first victim of Russian occupation. He is last seen being taken away by men in military gear and forced into a car. His body was found 12 days later, bearing signs of torture. Police investigation led nowhere. 16 March. A referendum is held in Crimea, making the peninsula part of the Russian Federation, and authorities claim an approval rate of 96%. 20 March. Ukrainian government recognizes the indigenous status of Crimean Tatars. 21 March. Russian Parliament creates two new regions in Russia: Crimea and the port city of Sevastopol, completing the process of annexation of Crimea. 27 March. UN General Assembly adopts the "Resolution Calling upon States Not to Recognize any Change in the Status of Crimea Region." 29 March. In an extraordinary session, members of the Qurultay, the elected body of Crimean Tatars, reject the annexation of Crimea by Russia. 11 April. The Crimean Parliament adopts a new Constitution making Crimea a democratic State within the Russian Federation. The Crimean Tatar language becomes one of three official languages on the peninsula. 21 April. Russian President Putin signs a decree rehabilitating minorities who suffered under Stalin’s repressive rule (Crimean Tatars, Armenians, Germans, Greeks and others). The Mejlis Building is searched and its Ukrainian flag removed. 22 April. Mustafa Jemilev receives a written document banning him from entering Crimea for five years. 3 May. Mustafa Jemilev is refused entry into Crimea at a checkpoint by Russian border guards. Thousands of Crimean Tatars go to the border to express their support for him. 18 May. 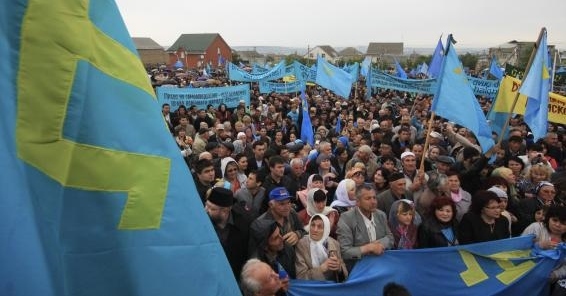 Crimean Tatars defy local authorities and gather in mass rallies to commemorate the 70th anniversary of their deportation at the outskirts of Simferopol in the presence of riot police and military helicopters flying above. 5 July. Refat Chubarov, Chairman of the Mejlis of the Crimean Tatar People, is banned from Crimea for five years. 9 July 2014. In response to the restrictions imposed on Mr. Chubarov, Amnesty International calls for Urgent Action, stating that this move highlights a broader trend of harassment. 28 July. The office of the United Nations High Commissioner for Human Rights issues a statement, expressing concern about the human rights violations in Crimea, following the annexation of the peninsula by Russia. 9 August. Ismet Yuksel, a Crimean Tatar activist and general manager of the Crimean News Agency (QHA) is banned from Crimea for five years. He is an ethnic Tatar from Turkey. 1 September. The building of the Crimean Tatar Mejlis is searched by security forces and boxes of files and equipment are carried out. Authorities later order that the building be vacated. 9 September. U.S. Rep. Ed Royce (R-California) speaks in the Congress and his report, “The Enduring Struggle of the Crimean Tatars,” is published in the Congressional Record. 18 September. European Union’s office of External Action issues a statement criticizing the intimidation of the Crimean Tatar Mejlis by the authorities. 27 October. Council of Europe’s Commissioner for Human Rights, Nils Muiznieks, releases his report, condemning illegal searches of businesses and private homes as well as mosques and churches. 17 November. Human Rights Watch releases its report, “Rights in Retreat,” documenting intimidation and harassment of Crimean residents who oppose the Russian annexation. 21 November. Crimean authorities carry out armed raids in the markets and cafes in Simferopol, targeting people of “non-slavic appearance” and detain about 100 people. 6 January. Rep. Gerald Connolly (D-VA) reintroduces “Crimea Annexation Non-recognition Act” and referred to the House Committee on Foreign Affairs. 23 January. A member of the Crimean Tatar Rights Committee, Sinaver Kadyrov is deported from Crimea by Russian authorities. 26 January. Crimea’s only Tatar-language television channel (ATR) is raided by masked investigators and riot police. 28 January. Freedom House, a human rights organization in Washington, DC, issues its Freedom in World-2015 report. Crimea is given a dismal freedom rating, 6.5 on a 7 point scale. 30 January.Akhtem Chiygoz, Deputy Head of the Mejlis, is arrested on charges of organizing and taking part in mass disturbances. More than a year later (May 2016), he is still in detention, waiting trial. Two other Crimean Tatars arrested on similar charges. 3 February. United Nations High Commissioner for Human Rights, Zeid Ra’ad Al Hussein expresses concern for multiple violations of the rights of the Tatar population in Crimea. 20 February. Crimea News Agency (QHA) learns that its license to operate is denied by Russian authorities. 27 February. President Putin signs a decree making February 27 a holiday in Russia. It will be known as Special Forces Day, the day that marked the military operation aimed to occupy Crimea. 1 April. The only Crimean Tatar television channel in the world, TV ATR, is forced to go off the air. Almost all Crimean Tatar media outlets in Crimea are now shut down. 3 April. ‘Anti-terrorist’ military exercises are conducted which clearly target Crimean Tatars. Cars displaying Crimean Tatar symbols are stopped for “checks” and Crimean Tatar homes are searched. 21 April. Continuing interrogations, home searches, and detention of Crimean journalists, most notably from the Center for Investigative Journalism and the Black Sea News. 30 April. In its latest report on freedom of the press, Freedom House gives Crimea under Russian occupation a damning assessment on human rights violations, including freedom of expression. It is rated at 94 on a scale to 100 (where 100 is the worst). 18 May. The 71st anniversary of the Deportation of the Crimean Tatar People is marked in Crimea by bans, interrogations and ‘warnings’ of Crimean Tatars. Journalists and Crimean Tatars taking part in traditional remembrance actions are detained. 11 June. In a clear action directed at Mustafa Jemilev, a Russian court in Krasnodar sentences his mentally-impaired son Khaiser to 5 years of imprisonment for an offense committed in 2013 in Crimea by a Ukrainian national and one on which a Ukrainian court has already passed sentence. 20 September. Crimean Tatar leaders call on Ukrainians to join a civil blockade of Russian-occupied Crimea, demanding the release of Ukrainian political prisoners, and the end of bans on free media in Crimea and the continuing human rights offenses. 6 October. Roskomnadzor, the Russian media regulatory body, announces that two websites providing information about events in Crimea are to be blocked on Russian territory, including Crimea. 3 November. Interrogations and searches of Crimean Tatars continue, including at the home of the former director of the silenced Crimean Tatar TV channel ATR. 12 November. Ukrainian Parliament recognizes the 1944 Deportation of Crimean Tatars from their homeland Crimea as Genocide. 20 November. Electricity is cut off to Crimea following the destruction of pylons transporting electricity, showing how dependent the peninsula is on Ukraine for its basic needs such as power. 9 December. The Helsinki Commission, an independent US federal agency, holds a briefing, “Human Rights Violations in Russian-Occupied Crimea” at House of Representatives in Washington, DC. 23 December. Four Crimean Tatars are arrested and face heavy sentences for involvement in Hizb-ut-Tahrir, an organization that is legal in Ukraine and other countries. 28 December. Crimean paramilitary group carries out a raid on Crimean Tatar homes accompanied by officers from Russia’s FSB and Centre for Countering Extremism. 4 February. The European Parliament in Strasbourg overwhelmingly adopts a resolution condemning the Russia Federation for the human rights violations in Crimea, in particular targeting of the Crimean Tatars. 15 February. Crimean prosecutor formally begins the legal procedure to ban the Mejlis of the Crimean Tatar people, charging it with “extremist” activities. 17 February. After finally bringing to trial the Crimean Tatar leader Akhtem Chiygoz and five other Crimean Tatars, the case was sent back for “further investigation.” The men have now been in detention for periods of 8 to 13 months. 2 April. At least 35 Crimean Tatars are detained after armed men wearing masks burst into a café outside Simferopol. Crimean Tatars are openly targeted, with people in the cafe “of Slavonic appearance”being ignored. 12 May. European Parliament issues a resolution on the Crimean Tatars (2016/2692 RSP), protesting the banning of the Mejlis, closure of media outlets such as ATR television, political prosecution of dissidents and civic activists, and the illegal detention of Ahtem Ciygoz. 14 May. Jamala, Ukrainian singer of Crimean Tatar origin, wins the 2016 Eurovision Song Contest, held in Stockholm. Her performance, watched by over 200 million people worldwide, draws strong criticism from Russia. Jamala’s song “1944” relates to the deportation of Crimean Tatars. 25 May. Crimean Tatar activist Erwin Ibragimov was kidnapped in his hometown Bakhchisaray and has been missing since then. He served as city council deputy and a member of the Executive Committee of World Congress of Crimean Tatars. 12 July. Ukrainian government adopts a decree, “On the Day of the Crimeans’ resistance to the Russian occupation,” that makes February 26 official Day of Resistance. On 26 February 2014, Crimean Tatars clashed with pro-Russian groups in the Crimean Parliament, a day considered the beginning of the Russian occupation of Crimea. 31 July. World Congress of Crimean Tatars Executive Committee reports that since the Russian occupation of Crimea 9 people have been killed, 15 kidnapped and 25 detained as political prisoners and publishes the names of all those victims. 18 August. Ilmi Umerov, deputy chairman of the Crimean Tatar Mejlis was forcibly confined to psychiatric hospital while he was being treated for a number of ailments. The pro-Russian authorities charged him for threatening Russia’s territorial integrity after he gave a television interview. 14 September. Mustafa Jemilev is nominated for the European Union’s Sakharov Prize by the European People’s Party. 29 September. Supreme Court of Russian Federation uphelds the previous ruling of the Crimean court to ban the Mejlis of the Crimean Tatar people. 15 November. United Nations General Assembly's Third Committee (Promotion and protection of human rights) adopts a resolution relating to Crimea, “Situation of human rights in the Autonomous Republic of Crimea and the City of Sevastopol (Ukraine),” that was submitted by Ukraine. This is the first UN document to recognize Russia as an occupying power. 12. December. Pre-trial detention of Ahtem Ciygoz was extended for another 3 months. Charged with organizing public “mass disorder,” Ciygoz has been in prison since January 2015. 14 December. Amnesty International issues a 14-page report, “Crimea in the Dark: The Silencing of Disent,” highlighting the human rights violations in occupied Crimea. 19 December. United Nations General Assembly adopted a resolution on human rights in Crimea, “Situation of human rights in the Autonomous Republic of Crimea and the City of Sevastopol (Ukraine), which was earlier adopted by its Third Committee on November 15. 12 January. H.R. 463: Crimea Annexation Non-recognition Act is introduced by Rep. Gerald Connolly (D-VA). The bill prohibits the United States government from recognizing Russia’s annexation of Crimea. 30 January. Human Rights Watch issues a news report, describing the harassment of lawyers who defend Crimean Tatars prosecuted on politically motivated charges. Emil Kurbedinov was detained on January 26 and Nikolai Polozov on 25. While both lawyers were freed, their detention did not go unnoticed by human rights organizations. 5 February. Crimean Tatar lawyer Emil Kurbedinov was released after spending 10 days in administrative detention. 26 February. On the third anniversary of the illegal Russian annexation of Crimea, Crimean Tatars living in Kyiv, Istanbul, Ankara and Constanta (Romania) hold rallies to protest the ongoing human rights violations in Crimea. This is also the Day of Crimean Resistance to Russian Occupation, observed in Ukraine. 2 March. US Charge d’Affairs Kate Byrnes speaks at the OSCE Permanent Council meeting in Vienna, reaffirming the US support for Ukraine’s sovereignty, independence and territorial integrity. She states that the lifting of Crimea-related sanctions on Russia is connected to Russia’s agreeing to return the control of Crimea to Ukraine. 3 March. U.S. Department of State issues a 14-page report devoted to Crimea 2016 Human Rights Reports: Ukraine (Crimea). Prepared by the Bureau of Democracy, Human Rights and Labor, the report covers various issues that fall under respect for the integrity if the person (disappearnces, torture, prisin conditions); respect for civil liberties (freedom of speech and press, freedom of assembly and association, freedom of religion); and freedom to participate in political process. 15 March. On the occasion of the third anniversary of annexation of Crimea by Russia, European Parliament passes a resolution on the Ukrainian prisoners in Russian and the situation in Crimea (2017/2596 RSP). Parts of the document relate to banning of the Mejlis, Crimean Tatars in prison or gone missing, infringement of the rights of the Tatar population, indigenous people of the peninsula. 16 March. US Department of State issues a press statement on the third anniversary of Russia’s “Referendum,” reaffirming US committement to Ukriane’s sovereignty and condemns on going human rights violations involving Crimean Tatars, pro-Ukrainian activists and independent journalists. 26 May. Emil Kurbedinov, a Crimean lawyer who defended many persecuted Crimean Tatars, receives the 2017 Award for the Human Rights Defenders at Risk, given by Front Line Defenders in Dublin, Ireland. 26 June. Crimean Tatar Flag Day is observed in Washington, DC, as well in Kyiv and Turkish cities like Istanbul and Ankara. On that day, the blue flag of Crimean Tatars flew along with the Ukrainian Flag on the roof of the Embassy of Ukraine in Washington and there was a brief ceremony to honor the indigenous people of Ukraine, Crimean Tatars.